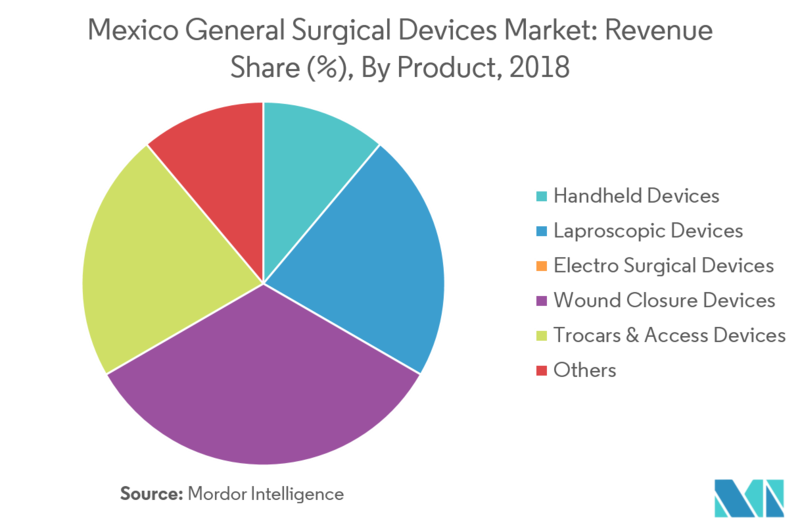 The Mexico General Surgical Devices Market is segmented by Product (Handheld Devices, Laparoscopic Devices, Electro Surgical Devices, Wound Closure Devices, Trocars and Access Devices, and Other Products) and Application. The Mexican general surgical devices market is expected to record a CAGR of around 4.8% over the forecast period, 2019-2024. Certain factors that are accelerating the growth of the market include rising demand for minimally invasive devices, technological advancements in general surgical devices, and rising unmet healthcare needs in the country, along with the rising expenditure on health. This rise in healthcare expenditure is anticipated to accelerate medical infrastructural development, which is likely to fuel the growth of the surgical devices market in Mexico. Major manufacturers of surgical devices are focusing on gaining a foothold in emerging economies, such as Brazil and Mexico, in order to expand their business operations and explore new markets, thus creating an advanced healthcare infrastructure. Thus, increasing healthcare expenditure, strong local manufacturing base, and rapidly developing healthcare infrastructure, have led to increased and advanced surgical procedures performed in this country. Hence, these factors are likely to offer immense growth opportunities in the Mexican surgical procedures market. The general surgical devices are specially designed tools or instruments that serve a specific purpose during a surgery, which include scissors, forceps, surgical needles, etc. 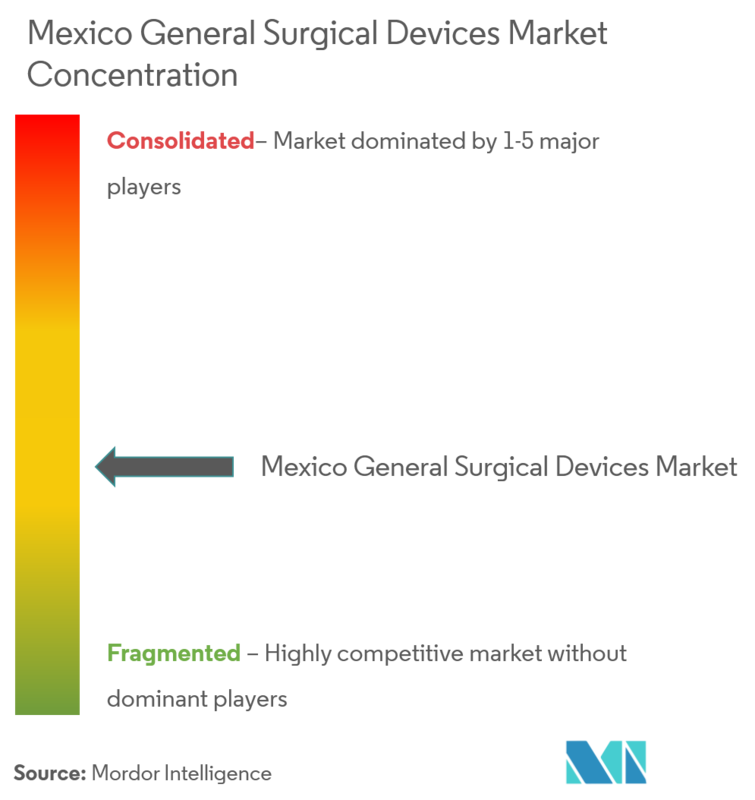 The handheld devices segment of the Mexican general surgical devices market is expected to register the highest CAGR over the forecast period. The demand for surgical equipment is increasing in response to the rising need for minimally invasive surgeries in the country. Handheld surgical devices are becoming increasingly advanced. 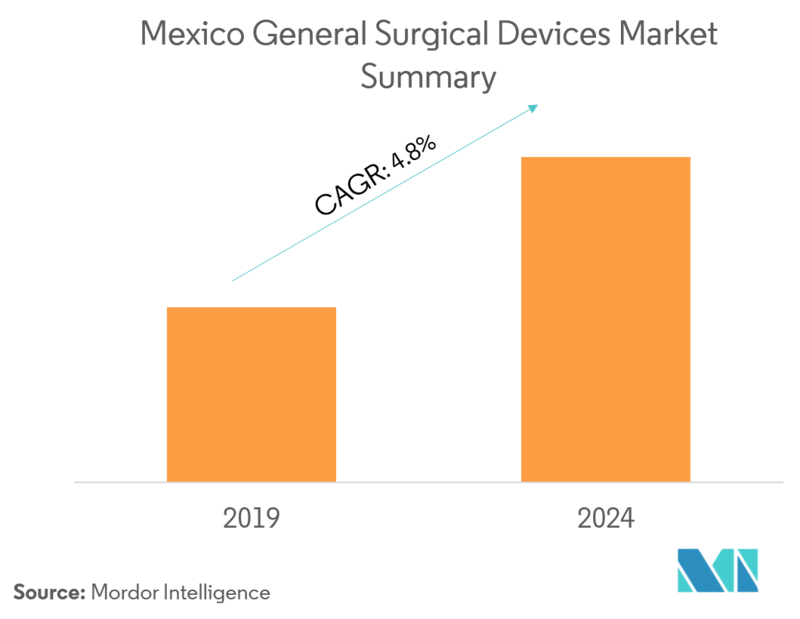 The large-scale use of advanced surgical instruments in recent years is driving the handheld devices segment in Mexico. The development of advanced tools, like robotic hand-held surgical devices for laparoscopic interventions, enhances a surgeon’s ability. Many innovations have been made owing to the need for high reliability, accuracy, and patient safety. Therefore, there is an increasing demand for handheld devices, which in turn, is helping the segment to grow faster. Some of the major companies in the Mexican general surgical devices market are B. Braun Melsungen AG, Boston Scientific Corporation, Conmed Corporation, Medtronic PLC, and Stryker Corporation. Along with these big players, the market is also witnessing some of the smaller players that hold a substantial market share.